One Shoe once again in the Emerce100: best agencies in the e-business! 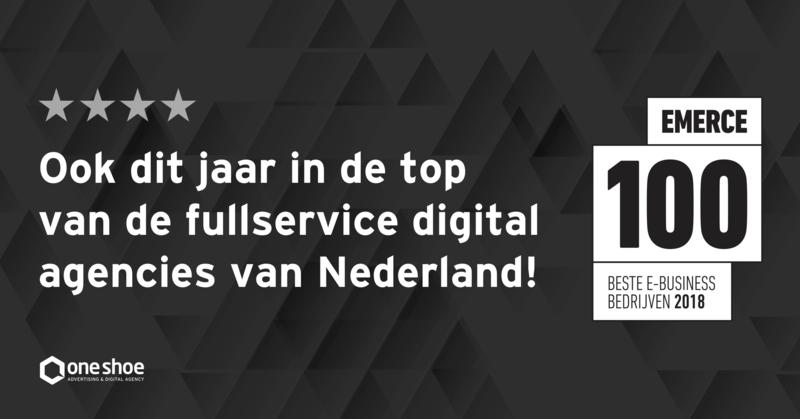 Like previous years, One Shoe is chosen as one of the top 100 best Dutch companies! Every year, Emerce collaborates with research agency Motivaction to publish this top list of agencies working in the e-Business. In the thirteenth edition of the Emerce100 One Shoe is placed in the fourth place in the category medium-sized agencies. The Emerce ranking shows how voters, working in the field of online marketing, ICT and e-business, measure the quality of services of the agencies in the e-business and marketing industry over the past year. The companies are judged on different criteria like knowledge/knowhow, price- quality ratio, reliability and flexibility.